Lemongrass Beef Skewers – amazing and juicy beef skewers grilled to perfection. A must-have for summer! It’s Labor Day weekend this week and I am sure many of you are throwing one last summer party before Fall arrives and the weather becomes colder. I have shared many summer recipes with you this year and I hope you have had a chance to try them out. I have two more recipes that will complete this summer. 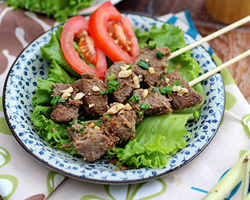 Let’s start with this lemongrass beef skewers that I absolutely love. Everything tastes better when they are threaded onto a stick and grilled over fire. I am a huge fan and I hope you like it, too. This Vietnamese-inspired beef skewers are marinated with fish sauce, lemongrass, shallots, and garlic. When you have these ingredients in your meat marinade, you are pretty much going to have some deeply flavorful meat. The fire will do its magic to char the meat and seal in the juicy flavor, and the end result is sure to please. As you know, grilled beef is dark, so I garnished these lemongrass beef skewers with some crushed peanuts and sautéed scallions (green onion), just like how most Vietnamese restaurants serve them. The beef skewer is tasty enough so you don’t actually need any dipping sauce. Try this lemongrass beef skewers recipe before summer ends, and I am sure you would want to have them again and again after this year. Slice the steak into small thin pieces approximately 3/4" square and 1/4" thick. Combine all the ingredients for the Marinade. Add the Marinade to the meat and mix well. Marinate for at least 1 hour. Soak the wooden skewers in water for at least 30 minutes. Insert the meat through the wooden skewers. Heat up the grill. Grill the meat for at least 2-3 minutes on each side, or until desired tenderness. Garnish the Lemongrass Beef Skewers with bits of crushed peanuts and sautéed scallion before serving. To make the sautéed scallion, heat up a non-stick pan with 2 teaspoons cooking oil. When the oil is hot, add in the 1/4 chopped scallions. Add salt to taste. Slightly sautéed for 1 minute. Hi, Our local markets don’t carry lemongrass. However, they do have the lemongrass in the tubes. Any thoughts of using that instead? Thanks! What do you mean by in a tube? Is it frozen? I like the combination of fish sauce and lemongrass. Can’t go wrong with them. what is your favorite Banh Mi stop in little saigon???? thanks and keep up the great job!!! Mardd Onn Selamat hari merdeka! Great recipe! Made it along with mu ping and Thai grilled chicken skewers from SheSimmers. We’re going to make them again tonight!